There are many potential causes of back pain. According to research 60%- 80% of the UK population suffer back pain at some point in their lives. In my opinion we can do a lot to help ourselves so we are not resigned to the fact that we’re going to suffer significant back pain. There can be many causes of back pain but often the most common is a mechanical pain. 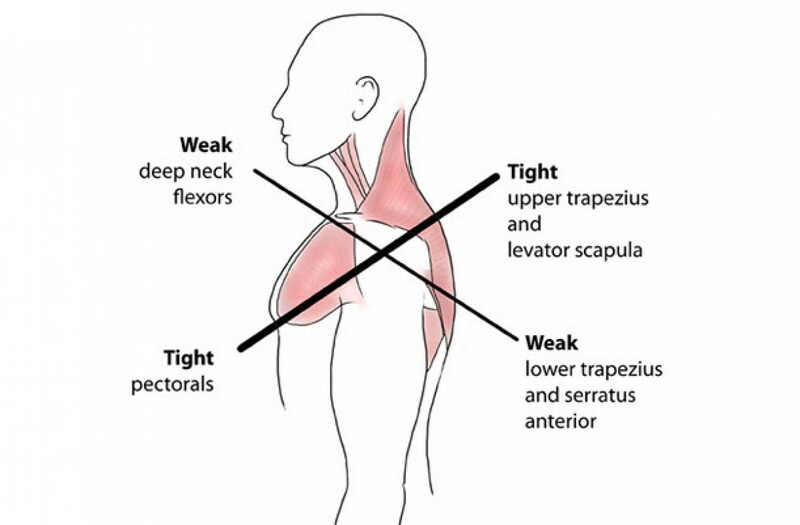 This means that the problem is in the mechanics of the back; the bones, muscles, ligaments, discs, joints, and nerves. In my many years of experience I have found that the starting point for this mechanical back pain is often muscle imbalance. This is often referred to as lower cross syndrome and is represented below. In this instance, without being too technical, the following process occurs: The Iliopsoas, rectus femoris and low back muscles become tight. The gluteals and abdominals become weak. These imbalances occur for many reasons but chief amongst them is our lifestyles. Many of us spend too much time sitting meaning that the muscles at the front become short and tight. These then pull the pelvis forwards in an anterior fashion. The back muscles become tight and painful and the muscles designed to counter this such as the abdominals - but particularly the gluteals - become weak. The low back joints then get compressed, which often results in pain and over time possible degenerative changes to the vertebrae and intervertebral discs. Sitting is not the only culprit - many active sports people fall into this trap as they don’t perform the correct stretches to offset their hard work and the gluteals become weak due to this imbalance. As a therapist, my goal is to evaluate this pattern, and there are simple tests that can be performed in the clinic. The next stage is to use osteopathic manual therapy techniques to help fluid movement, reduce pain and get the lower back moving better meaning - hopefully - less pain. The final part of the process is to stretch the identified tight muscles and give simple strengthening exercises (particularly for the glutes) that can be done at home. Indeed, the current NICE draft guidelines support the use of exercise with manual therapy when used together as treatment for low back pain. I must stress that this is not an instant fix. Often you should experience some pain reduction after one session but realistically, time is needed for you to make the adjustments to your muscles, which will provide you with the best chance of a long term solution to your back pain. As I mentioned in earlier articles - do not wait until you are in pain. The above strategies are used to help improve your chances of ultimately not joining the 60-80% of the population with low back pain.